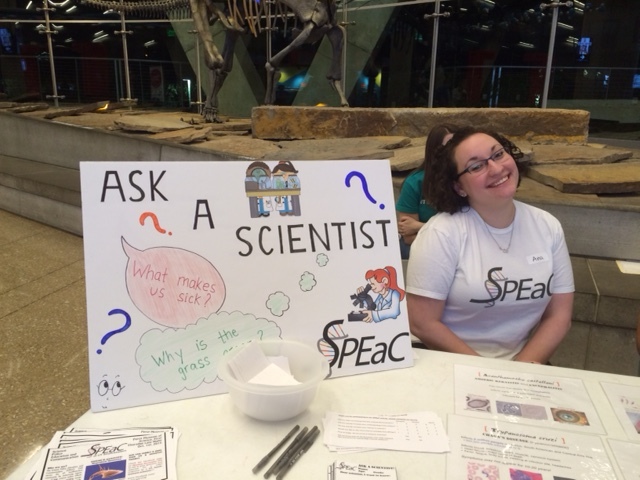 What is SPEaC’s “Ask a Scientist” project? Ask a Scientist is a program launched in 2015 meant to increase interaction with our local community and provide practice to UT Southwestern scientists and trainees who want to improve their communication skills. Sometimes we will simply chat with members of the public about science in an informal setting. At other times, members of the public submit questions about a variety of scientific topics to us, and we make Youtube videos answering as many of those questions as we can. We then post links to those videos on our social media pages, like Facebook and Twitter, so that they can be enjoyed by anyone who would like to view them. You can also learn more about Ask a Scientist from this blog post. How do people submit questions for Ask a Scientist? First, people submit questions to us directly during our outreach events. We usually have an Ask a Scientist sign and a collection box at our table during events we hold in public. Second, you can send us your questions by filling out this online form. What are the Ask a Scientist videos like? The videos are short responses recorded by UT Southwestern scientists where they explain the answer to the given question. Below is one of our Ask a Scientist videos, as an example. Make sure to check out the rest of our videos on Youtube too!